Emblem, the 22-storey residential tower is the central and connecting element of a large urban rejuvenation in the inner city suburb of Waterloo. The building is flanked on either side by two two smaller residential buildings designed by different architects and is located between the new urban park, Wulaba Park and Gadigal Avenue. A strong sense of place is created through the careful balancing of contextual response, residential amenity and building form. BVN’s design is the largest of three buildings on the site with a common basement car park linking all three buildings. 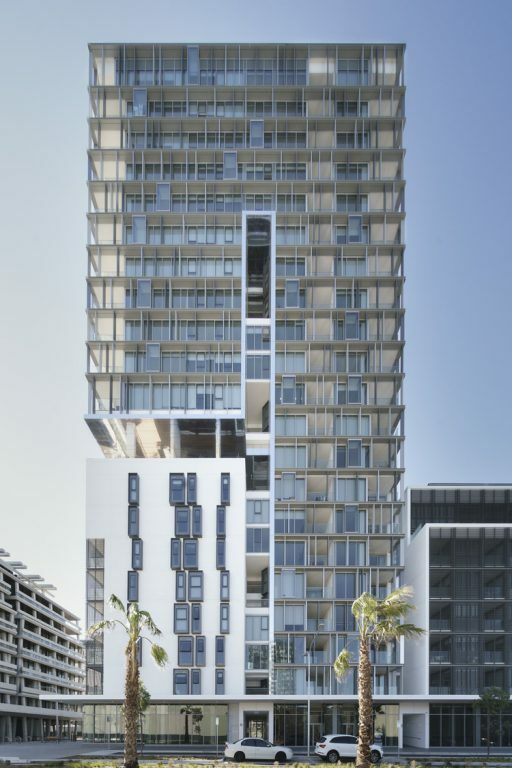 The massing is broken into a series of stacked boxes that have an interconnecting relationship linked by open walkways, slots and landscaped terraces. The streetscape massing (6-8 stories typically) has a different architectural character from the tower. These forms are more intimate in their architectural character and smaller in massing dimension. The fine grain of the façade and fenestration requirements are offset by the strength in the massing. The key intersection point between the tower and the streetscape massing is exploited with the creation of a large double height communal sky garden on Level 8. Rooftops from level 8 down form a series of cascading gardens. The cascading landscape creates integrated, verdant and diverse sequence of external spaces that complement the architecture and contribute to both the private domain of the residents and the public domain of the neighbourhood and the wider precinct. Site resident links have been created across the site to improve cross block access and views to the park. Lift lobbies within the building have been designed to be open, linked by multi-storey voids and gardens. Circulation spaces within the building, allow for serendipitous interactions to occur between residents as an extension of the streetscape and create a community of residents.